Talk, not action, powers a sly Agents Of S.H.I.E.L.D. S.H.I.E.L.D. has an image problem. The division literally went down in flames during Captain America: The Winter Soldier, and everything Phil Coulson did to build it back up in the ensuing year took place in secret. But thanks to the Sokovia Accords, that’s no longer an option. The public needs to feel safe about bringing back a program with such a tarnished history, and to do that, everything has to be (or at least appear) aboveboard and purged of any threatening problems. Unfortunately, America’s most trusted and recognizable symbol of superpowered safety, Captain America, went AWOL. There’s a number of reasons Phil Coulson couldn’t be the public face of the new S.H.I.E.L.D. So he tapped someone the public could trust, and who would represent the potential for inhumans and humans to live in peace with one another. If only we knew anything about him. Okay, that’s not entirely fair: Agents Of S.H.I.E.L.D. 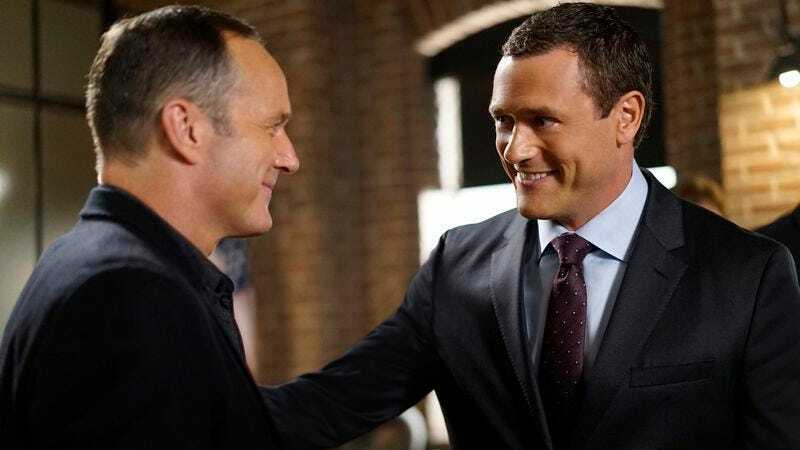 did a solid job with the reveal of the new director’s inhuman abilities, and the subsequent conversation between Director Jeffrey Mace and Coulson revealed a lot about where the two men stand, not only in relation to the organization, but to one another. Those invested in the comics may recognize the name as the real moniker of the Patriot, a superhero who first appeared in 1941 (thus explaining Marvel’s casting reference to the new director being someone ”whose Marvel roots go back to the 1940s”), and who actually took on the mantle of Captain America for a time. If the America of the MCU is one in which the Patriot existed—even for a short while—it would explain why Coulson believes the public will embrace him as a trustworthy new figurehead for S.H.I.E.L.D. We were kept in the dark about his powers, and the show is still dangling that information as a story for a subsequent episode. It’s too bad we didn’t get more talk about circumstances in “Meet The New Boss,” though, because all the dialogue we did get was sparkling. Full credit to standout writer Drew Z. Greenberg here, who again turns in a script crackling with wit and verve. Laugh lines were genuinely funny, dramatic beats were earned, and all the characters seemed to be playing to the top of their intelligence, even when they weren’t entirely sure what’s going on. (When Mack suggested the being they were after might really be an actual ghost, Elizabeth Henstridge’s wide-eyed delivery of Simmons’ “That’s also a theory” was flawless.) All the exchanges between our various groups of agents and vigilantes felt both honest and smart, driving forward the narrative with even the most breezy of bon mots. In this way the episode mirrored its plot, as clever words and “optics,” to quote the director, took prominence over action. Daisy Johnson benefited the most from this injection of great character lines, as her subtle interrogation of Robbie reminded everyone of the immensely likable personality that’s all too often hidden by this series under several layers of brooding. Best of all, those unspoken emotional wells were dragged into the open this week, as Robbie calls out Daisy’s damage in a matter of minutes. She wants to die, he bluntly informs her as he’s rooting through her things. She’s doing everything but hang a sandwich board around herself that reads, “Kill me now.” Her frantic pursuit of justice has a clear point of view behind it, as Robbie notes. She’s doing penance. She’s trying to do right in a bid to escape her past—or embrace her death-wish future, to be more accurate. It’s why he sees himself in her, and why the episode’s stinger features her getting into his car: They recognize in each other a desire to mete out justice, even if it puts their own lives at risk. Hell, especially if it puts them in mortal danger. It’s not hard to understand why this infuriates Fitz, and disappoints Mack. The discovery that Yo-Yo’s been helping her, and that Daisy’s the cause of their supplies disappearing, is more than just abandonment of the team. It’s betrayal of the fundamental trust the guys assumed still existed between everyone, the code of mutual dependence Coulson instilled among them. When she ran away, they didn’t like it, but they could at least understand. This is worse, because her behavior plays on that very trust even while undermining it. “We’ve all been through terrible things, all of us,” Fitz yells, and he’s not wrong. There’s isolating yourself (a tactic with which every member of the group is familiar), and then there’s removing yourself from everyone’s lives without concern for what it may do to them. Sure, she’s hurting—both herself and her friends. Of course, no one is hurting quite as badly as Melinda May right about now. The infection (or whatever it is) is getting worse, and watching her progress from standard-issue May “I can handle this” behavior to all-out shrieking in restraints was upsetting to see. It’s unsettling to witness someone as laconic and put-together as May lose it (which is doubtless why the show did it), and given Ghost Rider only dispatched one of the vengeful spirit-beings in this installment, there’s presumably more creepy demon-face effects to come. It would be nice to assume the new director will get her proper treatment, but since we just learned he’s an Inhuman all of five minutes ago, trust might be a ways off, still. As the mystery about what’s happening with the Watchdogs, the Chinese gangs, and Momentum Labs deepens, the real questions still involve our fractured team. Everyone but Daisy (and Yo-Yo) might still be a part of S.H.I.E.L.D., but they’re no longer a team. Regulations and classified levels have sprung up between them, and it’s going to make for some painful situations. Daisy isn’t the only one feeling abandoned and alone right now. Maybe if Coulson’s team hadn’t been scattered to their respective corners of the organization—and prevented from knowing what’s going on with each other as a result of the new director’s intense concern with transparency and appearances—Fitz wouldn’t have been so pissed at his former teammate. But some losses require more than a PR tour to be restored to full strength. “I can do May.” Eloquent, Agent Piper. Really, Daisy had some dynamite exchanges. From frying the van mid-talk to “You just said that, like, 10 seconds ago,” she was a wellspring of fun character beats. 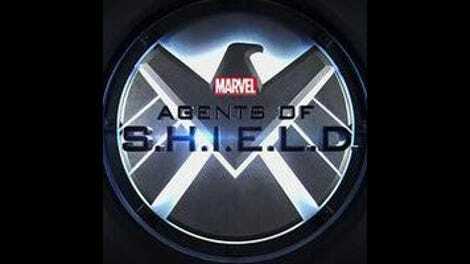 See, Agents Of S.H.I.E.L.D.? This is how you play to Chloe Bennet’s strengths. Conversely, while it was very cool watching Daisy launch herself onto the hood of Robbie’s car, it wasn’t exactly a smart move. Mack called Fitz by his “Turbo” nickname a lot tonight. Anyone else notice that? The MacGuffin of this book that Lucy and her fellow ghost-people are going after suggests this might actually be a lengthier story arc than I expected. If this is really going to develop, the show better give some depth to these apparitions, post-haste. Was even more pleased with the twist of having the director being a really personable, self-deprecating dork than having him be an inhuman. Welcome to the Marvel universe, Jason O’Mara. One downside: No Dr. Radcliffe this week.